YouTube is World's #1 video sharing site World wide. It has millions of videos and uploads thousands videos for every minutes from users. YouTube has some terms and conditions to upload videos on YouTube. Youtube terms and conditions prevents users from uploading sexual content videos. If a video with explicit content is uploaded, it is very likely to be taken down by YouTube moderators without any prior notice. 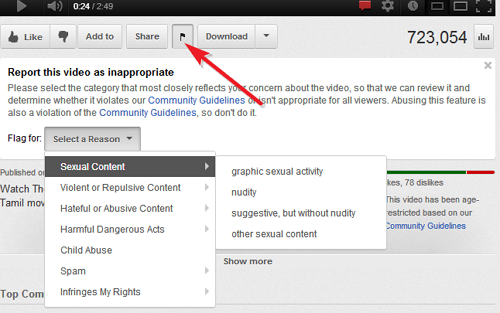 And also there is a option to youtube viewers can report sexual content videos on Youtube to it's moderate team. Then select the reason as "Sexual Content" and select sub- reason from menu which is match that videos. Your report goes to YouTube moderate team and they review that video. 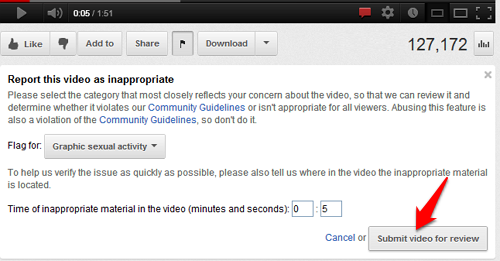 If your report is correct they will remove the video from YouTube.